As Mount Calvary Baptist Church began to pursue funding partners for its capital expansion project, church officers realized that a well-developed analysis and performance story were needed. Marketing Moves conducted a thorough business analysis of the church's operations, and then packaged the findings into a Performance Summary and Prospectus (similar to an annual report). 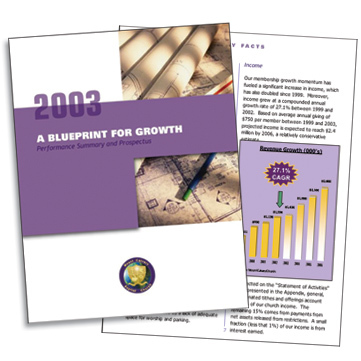 This document shared the church's growth story with the banking community and helped to mobilize the congregation's support of the capital expansion project. Within three months after the completion of the prospectus, Mount Calvary had secured funding to purchase a larger facility. "The team at Marketing Moves gathered the right information and used their creativity and analytical skills to bring our capital expansion plans to life. We had an incredible growth story that was not being shared effectively. Marketing Moves helped us to reposition ourselves to the banking community and to gain stronger support from our membership base."